I swear today is one of the hottest days of the year so far. Summer has begun. You can tell if you're inside a mall and you're still sweating. The accumulated heat in a car parked outdoors is like an oven placed on full power. You want to make the least movement possible so you won't excrete any perspiration. The burning rays of the sun weaken you. So what did I do to ease up and refresh myself ? 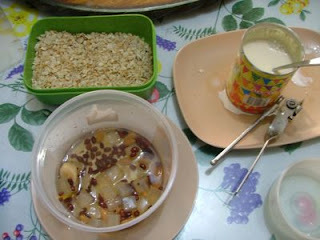 I made myself one (ok, I had 2nds), tall glass of halo-halo. 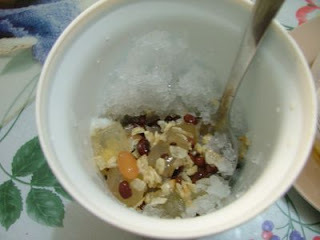 I grated 6 cubes of ice, added some nata de coco, white beans, red beans, langka shreds and a whole lot of pinipig and topped it with milk and a dash of sugar and behold...something to take my mind off of the tremendous heat. Funny, I tried thinking of the English translation of halo-halo and all I could think of is it's literal translation being "mix-mix" unless you want to mention all the ingredients to someone who may ask what exactly is "mix-mix".